In the autumn of 1811, German writer Heinrich Von Kleist shot and killed Henriette Vogel, the terminally ill wife of a business partner, before putting the musket to his own temple. Kindred spirits in despondency, the two had entered into a suicide pact, which they executed on the banks of the Kleiner Wannsee river. It’s a true story as sad as it is strange, especially if one considers that Kleist would become one of the most celebrated authors of his era, that Vogel may not have been as sick as her doctors believed, and that both were in their early 30s when they threw their lives away. Amour Fou dramatizes the couple’s final weeks, but not in the manner one might reasonably expect. Rather than take their actions at face value, as a grand romantic gesture, writer-director Jessica Hausner slyly interrogates them. She’s made a bone-dry comedy of manners, finding absurdist humor in material most filmmakers would probably play straight. Though historians disagree on which of the two conceived of the double-suicide plan, Amour Fou entertains reports that the writer shopped around the idea before finding a willing death partner. Stricken with an incurable case of melancholy, Heinrich (Christian Friedel) is introduced actively pursuing a soul mate in Berlin; he’ll only consider candidates so deeply smitten that they’d find death with him preferable to life without him. Flatly rebuked by his sensible cousin Marie (Sandra Hüller), Heinrich redirects his energies to a rebound courtship, making the same ghoulish request of married aristocrat Henriette (Birte Schnoeink). A flattered fan of his work, she genuinely mulls his proposal, seriously considering it after receiving a potentially fatal medical diagnosis. Wouldn’t it be better to go out in a blaze of passion, she rationalizes, than to wither away on a deathbed? As played by Friedel, who previously starred as the gentle schoolteacher in Michael Haneke’s The White Ribbon, Heinrich seems less brilliant artist than angsty teenager. He sees nothing unreasonable about what he asks, and takes every refusal like a garden-variety rejection. (“It would make me very, very happy,” he hilariously pleads to his cousin, as though her desire to keep living were the height of callousness.) That makes Amour Fou, despite its costume-drama trappings, a comic jab at a certain enduring breed of creep—the self-described romantic who wears down his conquests with guilt trips and emotional manipulation, but whose “love” is really just a reflection of his own narcissism. The fact that Heinrich would be happy with either prospective paramour/victim says a lot about how deep his sentiments really run. Harder to discern is what Henriette gets out of the whole arrangement. Some scenes suggest that she may be vaguely unsatisfied with her charmed life, the cozy domesticity she shares with her sweet if faintly boring husband (Stephan Grossmann) and their young daughter. Just as she did in her last feature, the equally ambivalent Lourdes, Hausner builds a movie around the complex motives of an unknowable heroine. She also presents a 19th-century high society so cloistered that dying prematurely for love might seem like an exciting alternative. “What if this was all a mistake?” Henriette wonders aloud while under hypnosis, a process designed to determine if her mysterious ailment is psychosomatic. But did Heinrich plant the idea in her head, warming her to his morbid scheme by convincing her that she’s unfulfilled? It’s notable that Henriette identifies as a fan of the author’s seminal The Marquise Of O, a novella about a woman who falls in love with a man who may have raped her. 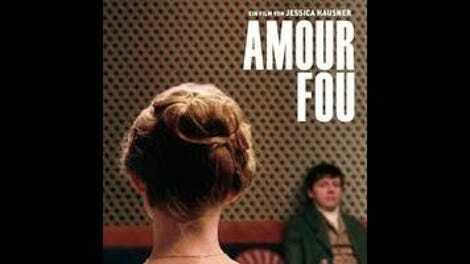 There’s an element of forced seduction to Amour Fou, too. It’s not a love story so much as a lesson in skillful coercion. It’s also a showcase for Hausner’s singular formal talents, her way with composition and mise-en-scène. Frequently capturing the action (or inaction, more often) in static master shots, the director arranges each scene like a richly detailed diorama. (She is a creative relative to Wes Anderson in that regard, though no one would ever call her films “whimsical.”) For all its precise verisimilitude, Amour Fou also possesses a certain deadpan creakiness—a deliberately awkward approximation of mannered aristocracy, as though the film were attempting to satirically out-stiff Merchant and Ivory. Characters engage in hopelessly polite conversation, seeming aloof even when discussing matters of life and death. The artificiality is funny but also thematically resonant: This is a film about fake feelings, the invented romance for which two strangers forfeited their futures. And to Hausner, such a colossal waste of potential deserves not a melodramatic tribute, but the cinematic equivalent of an eye-roll.